What a great feeling it is to know that we are doing our bit to reduce our carbon footprint. Thanks to AdtechEco for the installation of our solar panels and inverter. Thanks Steve and the team of installers for a professional job. It's so pleasing to see professional tradesman at work. To the team at AdtechEco. Thank you for all your help over the last few weeks and to the installers on a job well done. 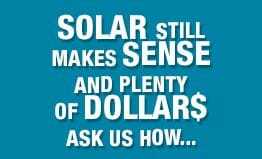 Our Solar system is turning the meter backwards saving me money!! !